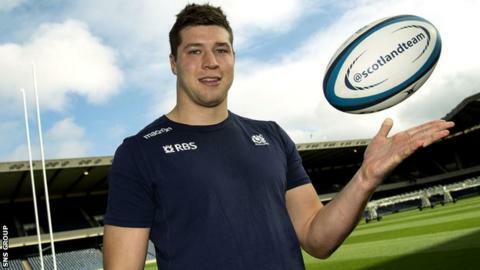 Grant Gilchrist is out of Scotland's autumn Tests having suffered a broken arm in Edinburgh's win over Lyon. Lock Gilchrist, 24, had been named captain for the matches against Argentina, New Zealand and Tonga. He was one of five Edinburgh players withdrawn in the first half-hour of Friday's European Challenge Cup match. And Tommy Seymour may also be withdrawn from the Scots' squad after being injured in Glasgow Warriors' Champions Cup defeat of Montpellier on Saturday. The winger was stretchered off in a neck brace after coming into collision with Sitaleki Timani. Edinburgh confirmed x-rays of Gilchrist's fracture were being reviewed by a specialist. "It looks as if there are hairline fractures in both bones in the forearm," Edinburgh head coach Alan Solomons told BBC Scotland on Saturday morning. "We'll have to wait for the full medical report for a clearer picture." And Scotland head coach Vern Cotter said: "Clearly this is really disappointing news for Grant, who's been a fine player and leader for his club this season; and was set to continue that role for Scotland this autumn. "Despite being unable to play, he will still join and be part of the squad in camp tomorrow (Sunday), and feature heavily in our preparations for the autumn Tests." Solomons revealed Hamish Watson had broken his jaw against Lyon, while Roddy Grant suffered a compressed cheekbone. He also believes Phil Burleigh has "grade two or three medial ligament damage", predicting lay-offs of between "six to 12 weeks" for those badly injured. Sam Beard had to go off with a head knock, while Edinburgh lost Scotland duo Alasdair Dickinson and Dougie Fife to unspecified injuries prior to the game. Edinburgh confirmed Watson and Grant would have operations. "We've always had tremendous morale and team spirit," added Solomons. "And in the last six weeks we have come together so strongly as a squad. "We saw that with the incredible win at Bordeaux and then this weekend again, with five guys going off and two guys withdrawing on the morning of the match. "It speaks volumes for the character of the squad and the composure shown by the players."